Cheap stunts to head off counterrevolution. Bangkok, Thailand April 16, 2011 - Just as the subjects of foreign aid and Israel were used as rhetorical pawns to usher Hosni Mubarak out of power, the same two points of leverage are being used to bolster US International Crisis Group member Mohamed ElBaradei, his underling, Google executive Wael Ghonim and their sputtering revolution. 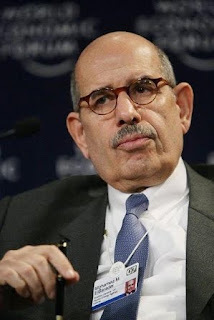 It was only last month that ElBaradei came under attack by protesters who pelted him with rocks while astutely shouting "American agent" at the interloping globocrat. Fearing a counterrevolution and perhaps a real awakening in Egypt, ElBaradei became the recipient of yet another fortuitous Wikileaks release, this one claiming that the US was unhappy with ElBaradei during his stint at the UN IAEA. Perhaps to be on the safe side, ElBaradei resorted to the tried and true rallying cry used often by the very dictators the "Arab Spring" was supposed to replace, threatening war with Israel. Of course, Mohamed ElBaradei sits within the US foreign policy think-tank International Crisis Group along with billionaire banker George Soros, US Army General Wesley Clark, geopolitical manipulator Zbigniew Brzezinski, former Foreign Minister of Israel Shlomo Ben-Ami, Bank of Israel governor Stanley Fischer, and current Israeli President Shimon Peres. The likelihood that he will start a war with Israel is so far-fetched it is insulting and speaks volumes of how little he thinks of those who have misplaced their trust in him. More recently, ElBaradei's personal webmaster, campaign organizer, and revolutionary leader, Wael Ghonim, has been pulling similar stunts to gain political points amongst a constituency he must consider profoundly ignorant and impressionable. Coming just one day after the New York Times reported US money, training, and assistance was behind the "Arab Spring," Ghonim was attending an IMF annual meeting in Washington to trade barbs with the IMF managing director. Ironically, Ghonim, working directly for a US stooge and with the now openly US-funded April 6 Movement, attempted to impress upon the IMF the necessity to "let the Egyptians solve their own problems." It would be unfortunate indeed if Egyptians didn't recognize the elementary propaganda being peddled before them. Should the Egyptians fail to dislodge these two disingenuous parasites and the global corporate-financier interests driving them, we can rest assured the globalists, after installing their "civil society" and implementing free-trade, will consume Egypt in its entirety. The global corporate-financier oligarchy are, as one wise man once put it, locusts in three-piece suits. They will consume until we either remove their source of subsistence from them, or they devour everything and everyone in sight.